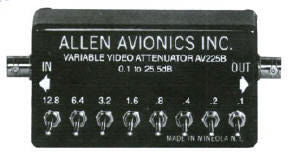 Allen Avionics has standard video attenuators like the AV225A with 8 switchable attenuators arranged in a binary series from 0.1 to 12.8 db. and a total range of attenuation is from 0 to 25.5 db. in steps of 0.1 db. In addition Allen Avionics can provide custom attenuator products to fit specific customer requirements of attenuation, bandwidth, amplitude, packaging and marking.